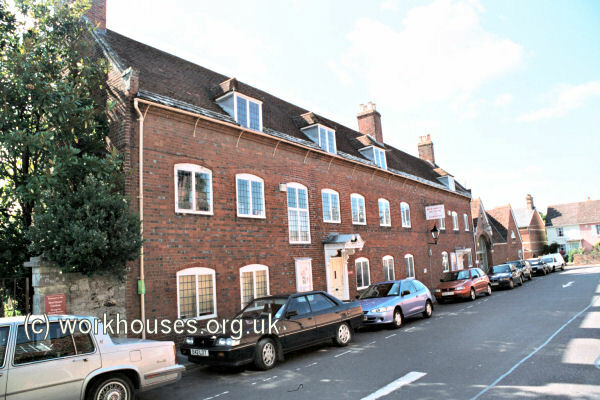 A parish workhouse was erected in 1763-4 on what is now Quay Road. In 1777, it was recorded as being able to accommodate up to 150. Hampshire: Christchurch (6), Holdenhurst, Sopley (2). Later Additions: Bournemouth, Christchurch East, Highcliffe, Holdenhurst, Hurn, Pokesdown, Sopley, Southborne, Winton. The population falling within the union at the 1831 census had been 7,089 with parishes ranging in size from Holdenhurst (population 733) to Christchurch itself (5,344). The average annual poor-rate expenditure for the period 1832-35 had been £3,622 or 10s.3d. per head of the population. The new Christchurch Union took over the existing Christchurch parish workhouse on Quay Road. The Poor Law Commissioners authorised an expenditure of £350 on adaptation of the building for operation under the 1834 Act. The workhouse layout is shown on the 1870 map below. The main building which fronted onto the roadside had the dining hall Guardian's board room at its centre. Men's accommodation lay at the north side and women's at the south, with the school room and children's quarter's in the rear central wing. Christchurch old workhouse from the north, 2000. By the late 1860s, poor conditions in the workhouse, together with the increasing population in the area, led to pressure from the Poor Law Board for the erection of a new and much larger workhouse. The Guardians resisted this, preferring instead to try and squeeze extra accommodation onto the cramped site. Eventually, in 1877, plans were prepared for a new establishment on the Fairmile Road. The old Quay Road workhouse is now the home of the Red House Museum. The new Fairmile Road workhouse, erected in 1881, was intended to hold 200 inmates. It was designed by Christopher Crabb Creeke, Bournemouth's town surveyor, and Edgar Burton. Desire by the Guardians to keep costs down resulted in a succession of cuts being made in the plans. The builder awarded the construction contract was Henry Blachford of Bournemouth. His estimate of £11,685 had been the substantial sum of £2,000 less then the next lowest. As a result it appears that the design and construction work left much to be desired. The new building was opened on 23rd August 1881. The new workhouse had an entrance block at the south along Jumpers Road. This featured a central archway with a porter's lodge and vagrants' wards to the west, and the board-room and married inmates' quarters to the east. Christchurch entrance block from the south-west, 2000. The main building was a pavilion-style layout with a central block containing the Master and Matron's accommodation, with the dining-hall and kitchen behind, and a workshop block running east-west at its rear. A women's block, linked by a connecting corridor, lay to the west, with a corresponding men's block lay to the east. An infirmary block was added in 1882 at the rear of the workshops. A children's home and school was added at the west of the main buildings in 1886. An additional men's pavilion was added to the east of the existing block in 1895. A large new infirmary complex was added at the north of the site in 1913. 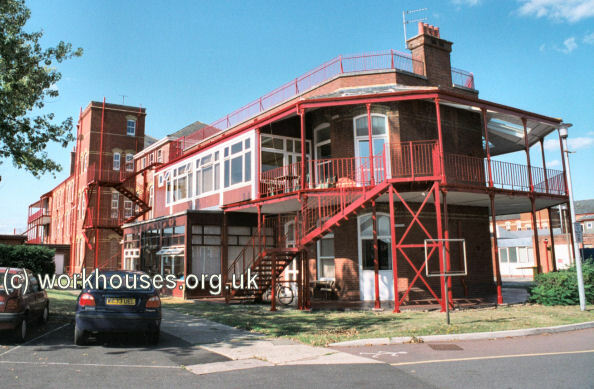 After 1930, the Fairmile Road workhouse was taken over by Bournemouth Corporation and became Fairmile House Public Assistance Institution. The buildings have now mostly been demolished. 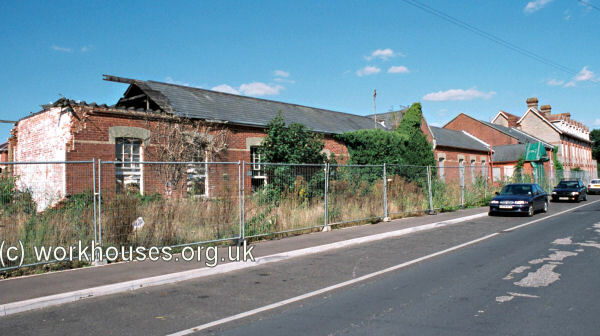 Part of the entrance range on Jumpers Road still survived in 2000, but the main workhouse site has been replaced by a housing development. The 1913 infirmary blocks survive as part of Christchurch Hospital. In around 1879, pressure on space in the olf workhouse led the union to open a school for workhouse children at Tuckton Farm on Tuckton Road. At the date of the 1881 census, 28 children were in residence. In 1894, a 21-acre site was acquired at the east side of Fairmile Road for the construction of a Cottage Homes establishment for workhouse children. Initially, four homes, two for boys and two for girls, were erected either side of a large green, together with a school at its eastern end. The homes were ready for occupation in February 1896. Each home could accommodate twenty children under the care of an assistant matron (later known as foster mothers or "aunties"), with overall responsibility for the site being placed under a Superintendent and Matron who had their own house at the western corner of the site. Two further homes were added in 1926. Christchurch Cottage Homes site, 1933. Christchurch cottage homes view north-westwards from in front of school, c.1925. Life in the homes was strict. The children were each allocated a number by which they were known, and this was sewn into all their clothes. The children wore a plain but distinctive uniform — for the boys this was shorts (all year round), thick grey socks, leather boots, grey flannel shirt, plus woollen pullovers and a grey jacket in winter; girls wore button boots, ribbed stockings, serge dresses and white pinafores. The children performed the household chores — scrubbing and polishing floors, cleaning windows, washing and mending clothes, helping prepare food, washing up etc. Meals were repetitive and any uneaten food would come round again at the next meal. Corporal punishment could be handed out for misdemeanours, which included bed-wetting. Christchurch homes scout troop, 1923. The cottage homes were demolished in the mid-1960s. 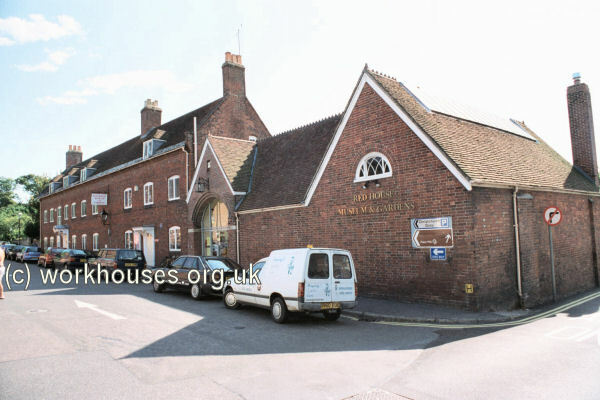 Dorset History Centre, Bridport Road, Dorchester DT1 1RP. Holdings include: Guardians' minute books (1824-5, 1835-47, 1852-66, 1876-87, 1892-30); etc. Thanks to Fraser Donachie for the kindly providing the cottage homes picture.